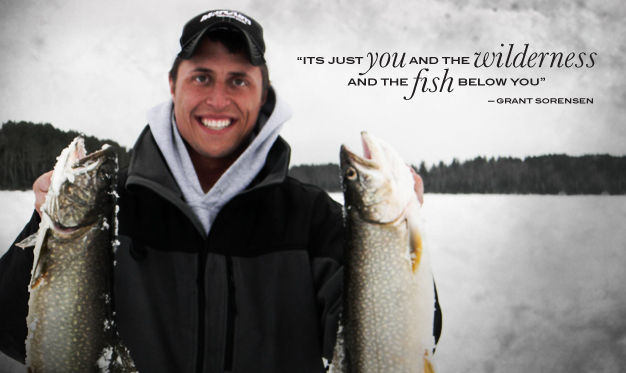 Like the St. Louis River he grew up fishing, Grant Sorensen is strong, spontaneous and a little untamed. Like three-hour treks by foot into Minnesota’s remote Boundary Waters Canoe Area (BWCA) to ice huge lake trout. A Duluth, MN, native, Sorensen grew up fishing area lakes and reservoirs. Soon, he took his skills further afield to the BWCA, Lake Superior and the St Louis River. “Every year, I’m the first guy out on the river, checking ice and looking for a safe route to my favorite early-ice spots,” he says. Fishing frozen rivers, among Sorensen’s specialties, requires specialized skills and extraordinary caution. Ice fishing on Lake Superior presents unique challenges as well. Despite such challenges, Sorensen wouldn’t have it any other way. His favorite quarry is lake trout. This entry was posted in Uncategorized and tagged Grant Sorensen, Pro Staff. Bookmark the permalink.